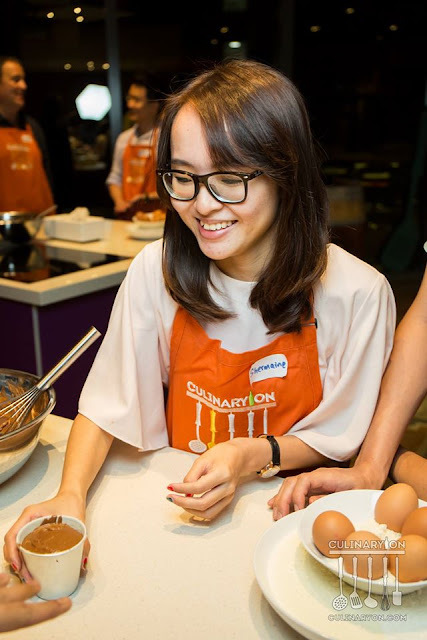 Recently, I've been hooked onto Masterchef Asia. 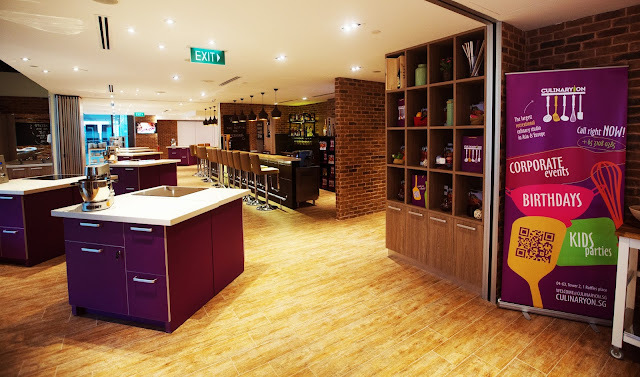 Aside from the awe-inspiring cooks-turned-chefs in the show, I'm thoroughly impressed by the layout of the MasterChef kitchen and its food pantry! The kitchen is obviously a really dangerous place— it's where knives can possibly come hurling at you and hot, boiling liquid may spill. 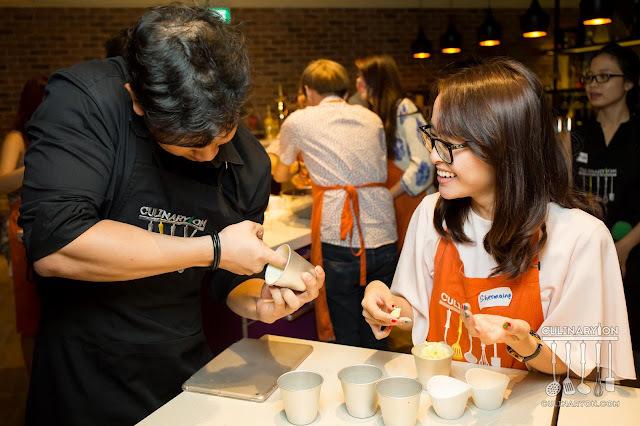 Yet, the CulinaryON team has managed to transform a dangerous place into an exciting playground filled with fun and laughter! 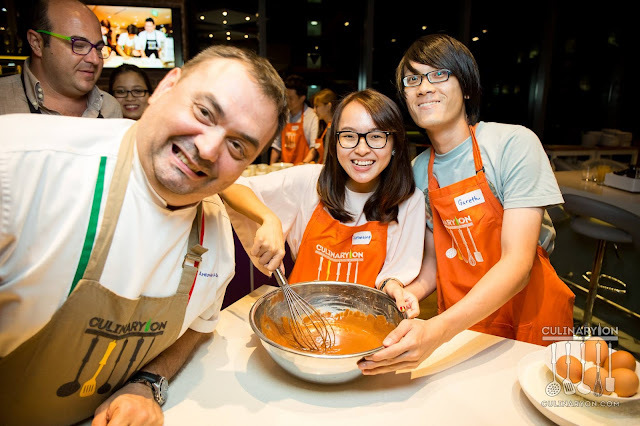 We were invited to CulinaryON's media launch party and were hosted by Chef Daniel! 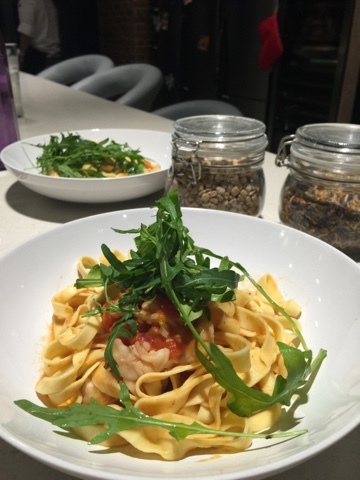 We were tasked to create these from scratch: pasta with shrimps and ruccola, as well as chocolate lava cake. At all smiles with Yvonne (left), myself and Gareth (right). 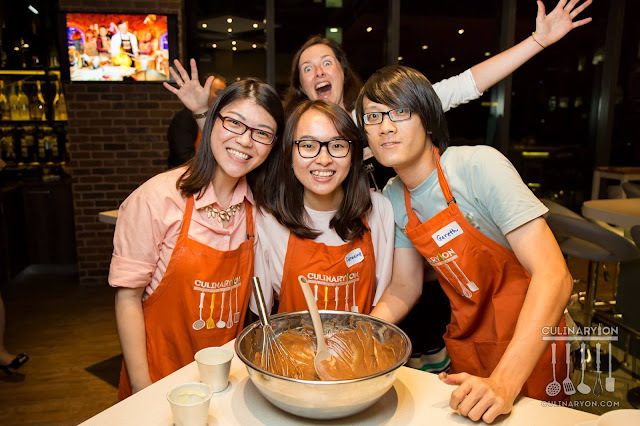 Marketing Manager Slavina is an experienced photo-bomber! 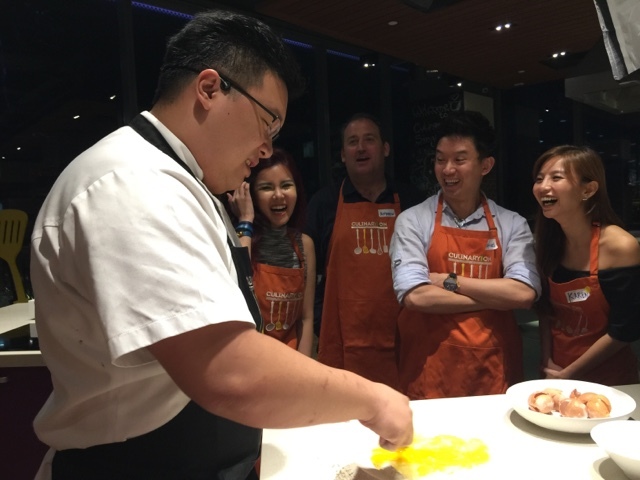 Our first task was to peel fresh, raw prawns. We could see the brain juice as we squeeze those out of its head, and huffed as we deveined the digestive tract from its slippery body. *switches on to squirmish Shermie mode* Phew, I'm really glad that there were ample sinks available for all of us! Don't you know that eye power can be great moral support as well? Teeheehee. I'd advise you not to wear any nail polish because you definitely have to get your hands dirty. 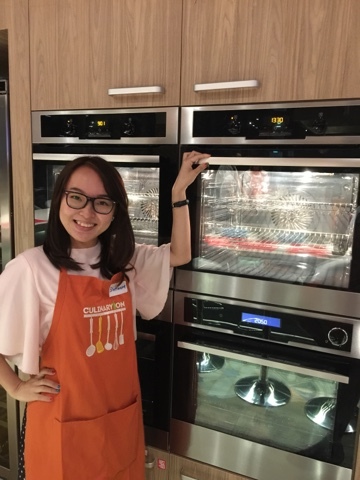 After all, this is a cooking studio! 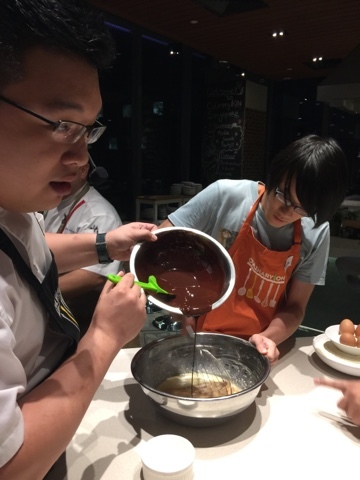 We went on to make the chocolate lava cake — a tender, dark chocolate cake with a gooey, fudge center that flows when sliced. The chocolate exudes this wonderful smell even before we did anything to it. 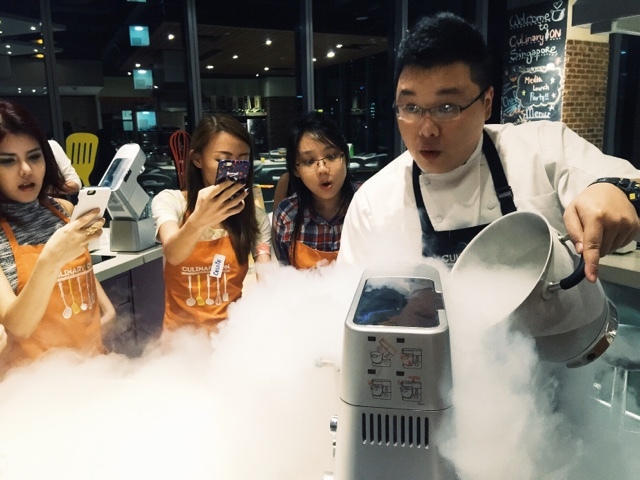 We also had to make the ice-cream from scratch, and it was my first time seeing how nitrogen gives the ice-cream its texture! 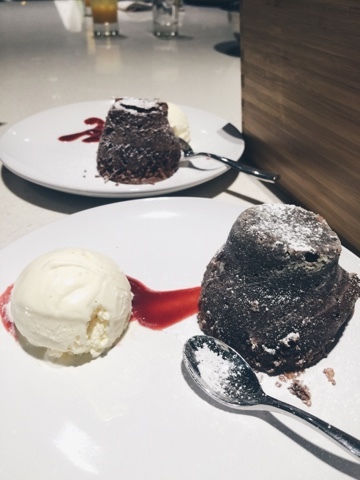 I really enjoyed the chocolate lava cake a lot. 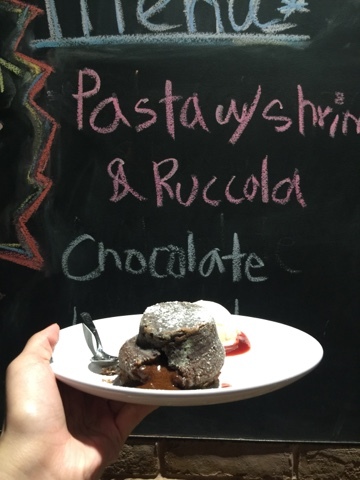 In fact, I fared so much better in creating the chocolate lava cake than in making pasta or peeling prawns. 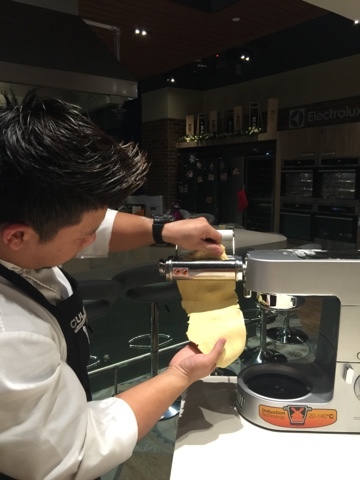 Oh yes, nothing beats making your own homemade pasta dough. Sure, it requires time, skills and techniques but the chewy texture is worth the effort! Creating fresh homemade pasta is not as easy as simply mixing eggs and flour together — you have to know exactly where to position these eggs and properly knead them. I had a lot of fun with the pasta dough machine— it reminds me of the play dough that i used to play when I was younger. Seeing how the thick, ugly pasta turned into a thin, silky piece is quite therapeutic. What I've learnt that day is that my knife work is absolutely terrible. Honestly, it's terribly difficult to estimate the size of each strand. I've got several zigzag noodle strands... well, if only Harry Potter really exists. He'd want to eat his lightning scar. Ain't no cooking with no fire! 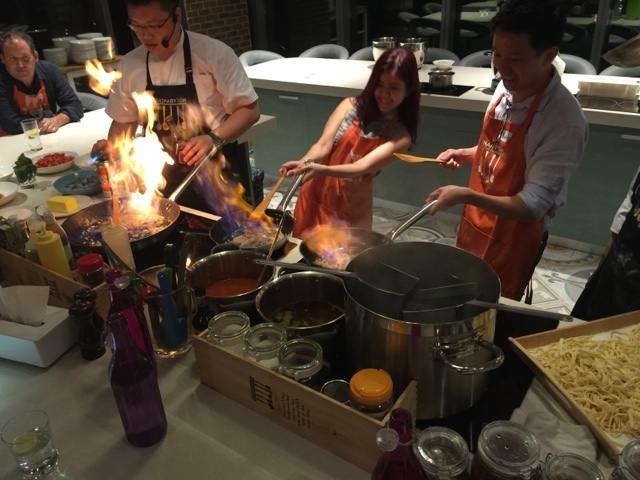 Of course, the best part is to watch the other bloggers cook and dodge the flame! 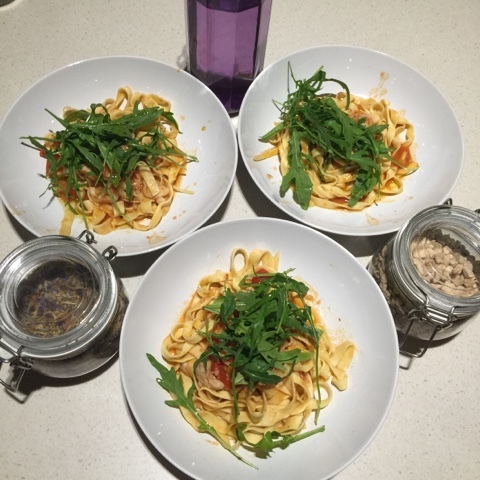 Phew, lucky I hid well and wasn't asked to cook... or we might not have any pasta that night. Ha! 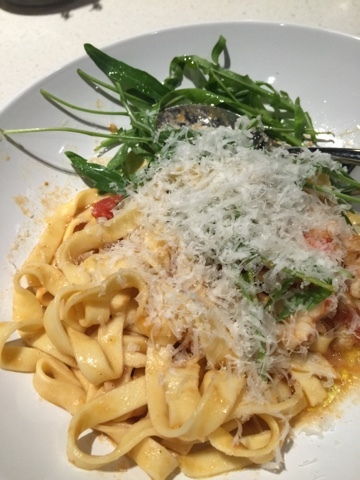 The pasta, unfortunately, was quite dense and lacked flavour. 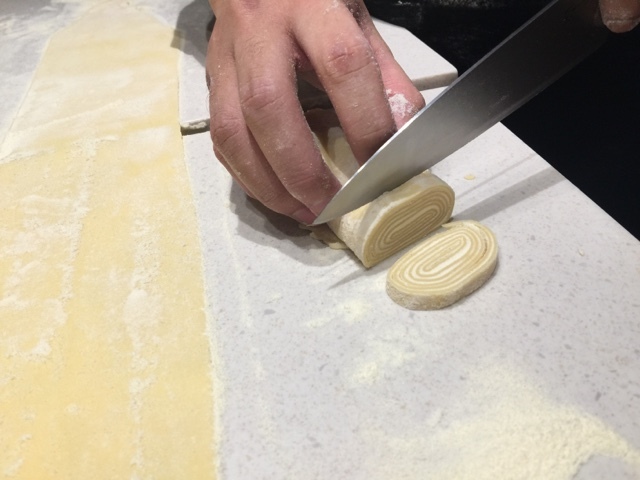 I think the bloggers (including myself) are to blamed, because we took quite a lot of time slicing the pasta (was it supposed to be spaghetti, or tagliatelle?). Hence, the pasta could not be cooked perfectly in time. Yvonne and I shared our thoughts with the bartender, and he suggested adding grated cheese! Woah, the grated cheese really does its' magic and gave its flavour! However, he said that eating pasta with cheese isn't common in Italy. "Its quite Singaporean-style," he said. Okay, I learned something new! Fight or dodge the fire! Having lots of fun at the media launch party! 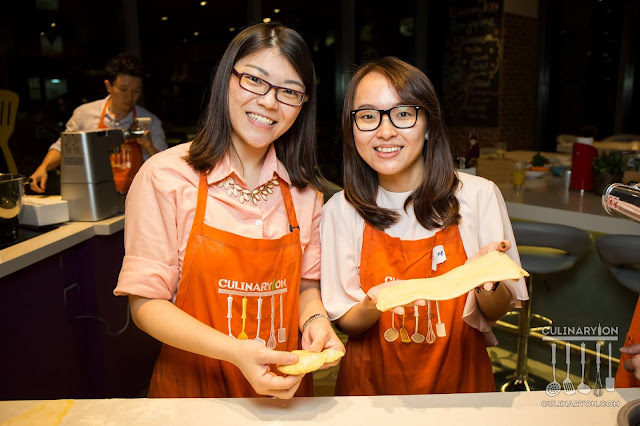 There are several themed parties at CulinaryON — you are not limited to cooking classes! 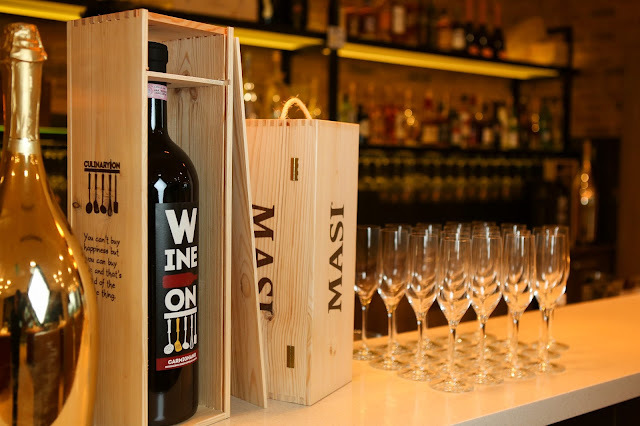 You can also try out a "wine and painting inspiration class". The possibilities are endless here. 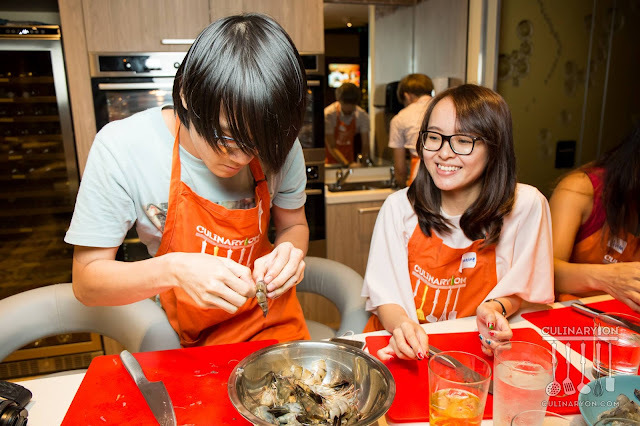 CulinaryOn offers culinary team building program in Singapore. It is great place for master classes, team buildings, kid's parties and birthdays. 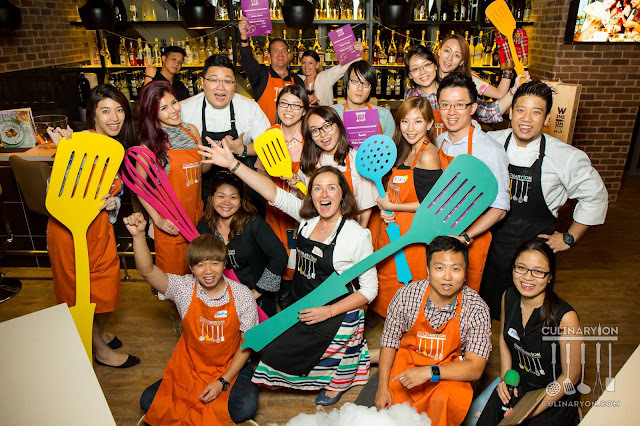 Europe’s largest edutainment culinary studio, unique culinary playground that amps up the fun and excitement in their cooking parties. 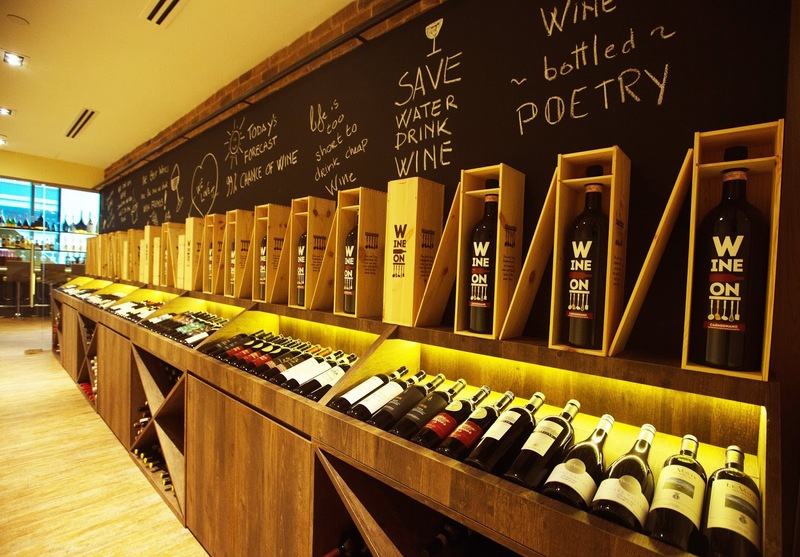 This one-of-a-kind concept was founded in Moscow in 2012, and 1 October 2015 the studio opened its second centre in Singapore.